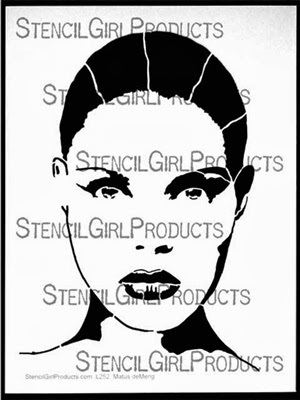 I was so excited to hear Andrea Matus deMeng was designing stencils for StencilGirl! I received Eve, A Modern Woman. This is a 9" x 12" stencil. Isn't she stunning?? The first thing I started playing with was Dylusions Spray inks over the right side of a gesso'd art journal page spread. I sprayed multiple colours and immediately closed the book. The trick to a good result is letting the pages completely dry before peeking as well as adding a bit of weight on top of your journal. I took a waterbrush and moved the Dylusions spray ink around to blend and soften. Such a fun look turned super fast and simple! It is also a great way to practice your shadowing technique. I focused on the right hand side page. I added three half circles of light yellow acrylic paint on top of the gesso. 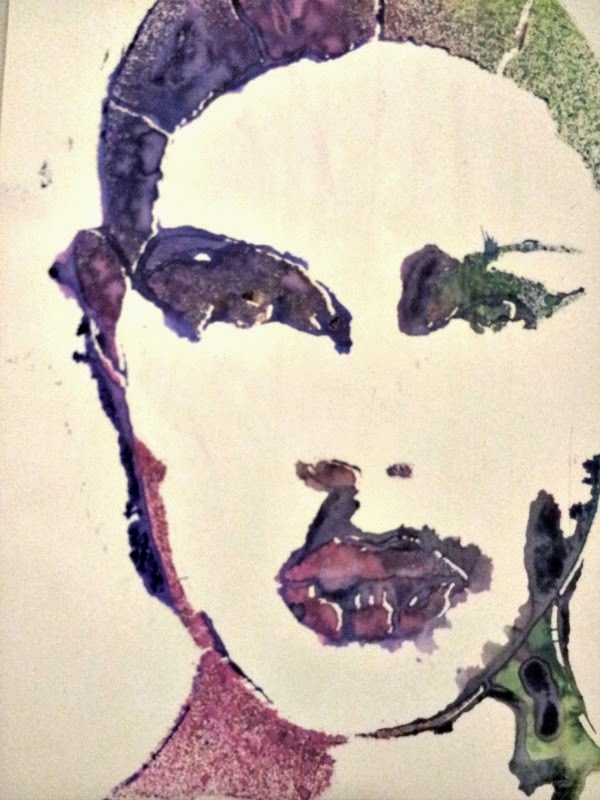 I then reapplied the stencil and lightly sprayed a dark and light purlpe spray ink. Once dry, I took a water mister and lightly sprayed the page, tilting to have the ink run slightly. I applied the stencil for the third time, assuring the features are aligned. 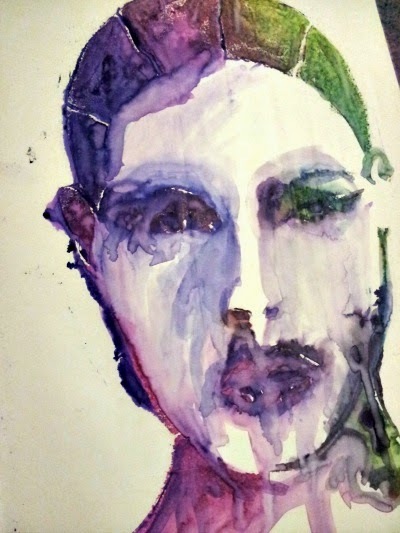 I chose a black student grade acrylic paint to sponge over the eyes, nose, lips and bottom right half of the face. I LOVE how this turned out! Not everything I try turns out great, check out this hot mess! :) I am still working out the uglies on this one. :) What went wrong? Way too much ink, no gesso... however a good coat of gesso will save it. 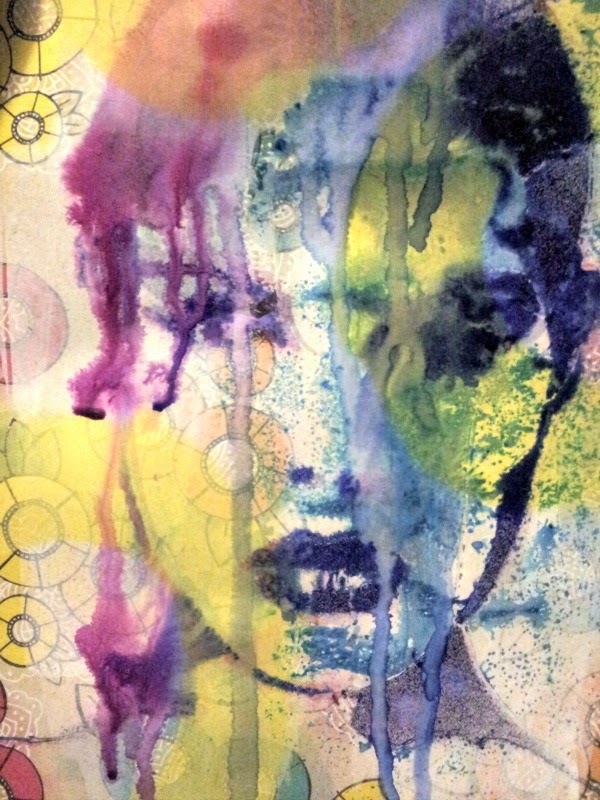 Remember this technique I shared on the StencilGirl Talk Blog? Since I already had the black paint out and my hands messy, I added the stencil over top of the packing tape transfer. My favourite part of Andrea's new designs is how they are the perfect addition to that awesome background you just hate to cover. Lastly, I had a lot of extra ink on my stencil so I decided to spray it with water and place between gesso'd pages of my art journal. Super quick background! Don't forget to continue on on the hop! 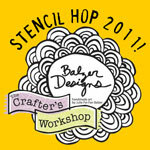 There is a giveaway going on on the StencilGirl Talk Blog! There will be two winners- one will receive a set of the new 6"x6" stencils and one will receive a set of the new 9"x12" designs. Comment on all the blogs for more chances to win! Contest closes on Sunday, April 6, 2014 at 11:59pm Central Time. Paula Phillips <--- You are here! Thanks for sharing all the different techniques.....very cool! Such a versatile stencil. Loved the dylusion ink game with the stencil, thanks for the inspiration! thank you for sharing your methodology and recovery. Awesome! I love the different techniques you used and how each page came out! Thanks for sharing and inspiring! Loving the face stencils. Awesome page Paula! Thanks for sharing. Hi Paula, I love how you shared all your process (even the 'hot mess', lol haven't we all done that!) with us. I love the face on the printed paper. Beautiful! Love that face! I'd love to be able to play with the new stencils. Thanks for the chance to win some. Love the use of layers with this stencil. The finished result is awesome! Wow, Paula! Love the black paint and stencil over top of the packing tape transfer! So cool! I always love what you do! Inspirational!! Great stencils I am so thrilled to have a change to win ALL SIX of Andrea's new 9" x 12" stencils! I have never used gesso with Dylusions before. I use a Dylusions journal and find the ink adapts well. I think I might try it in one of my other books tho. WOW, great technique. It would be hard to wait for it to dry. All of these pages are so cool. Thanks for sharing. Thanks for sharing your techniques, Paula! I love this mix of colors and textures for the eye. Came out great. Thanks for sharing all your ideas & techniques. I love the drippy spray face with the black acrylic eyes, nodr & lips. VERY artistic-looking. Enjoyed seeing both the positive and negative as well as all the techniques you used with the stencil. Quite inspiring. Thanks so much. Great pages. I love the watercolour effects! Love the stencils and am inspired by your technique. I noticed your before and after weight loss pictures. You looking simply amazing and very young. You should be so proud of your accomplishment. Oh, I like the work you did with the stencil. Thanks so much for sharing these step outs. Love the black packing tape and the watery look too! You did so many cool experiments! I will have to give them a try. Paula, I adore all the experiments you did. Personally I'm very fond of the drips and letting the background show through. Really looks fabulous! Thanks so much!! Thanks for all the inspirational techniques, even the hot mess. The results are great. My afvourite are the one on the packing tape transfer and the one with the paint drips. You chose a beautiful stencil...and the results are outstanding. Love what you did with your project! 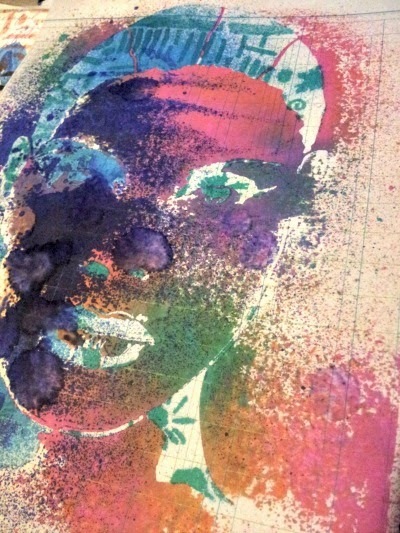 What awesome results from this one stencil! Great job! Your technique is something I have never seen before. So many different looks for just one stencil. Thank you for sharing your talent with us on the Hop. Paula, your work inspires as always! 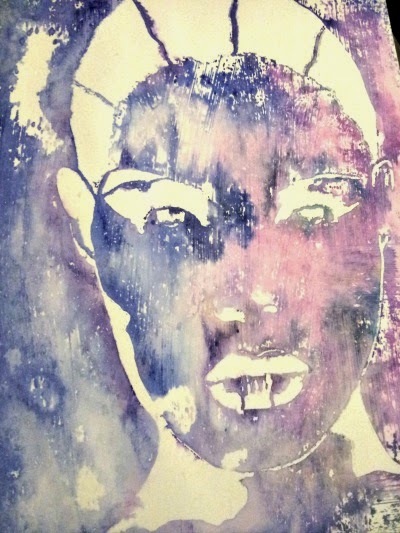 It's great how you created a watercolour effect! Very cool. 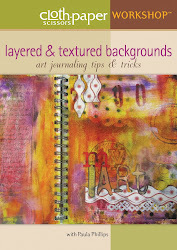 I just love it, what a great use of a art journal page! Thank you for all the ideas! I love all the layers Paula. I love the way the drippy page turned out. That face reminds me of the girls in Robert Palmer's "Simply Irresistible' video (I'm dating myself). I love what Christine O said just before me! I love what you've done--edgy and feels emotional. IMO very successful! 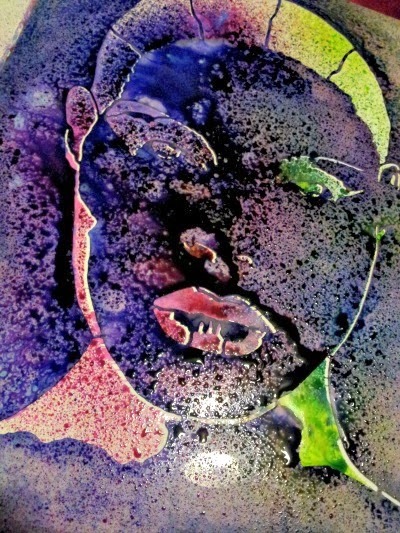 love what you showed with this stencil-amazing! Each and every page you did is ah-mazing!! Looks like it was tons of fun! I have 'done' the spraying and then closing the journal to print on the opposite page, but havent ever let it dry before peeking/removing the stencil... thanks for the tip... will try it! Wow, Paula, your pages are super fantastic. Thanks for showing us different techniques when using Andrea's stencil. All the stencils are great and cannot wait to play with them. I even loved the hot mess! They were all great. Great stencils and beautiful work. I love what you did with the face stencil, Paula. I love how your pages turned out- I must have this stencil…that's all there is to it. Your dylusions technique is so beautiful, thank you Paula, for sharing! 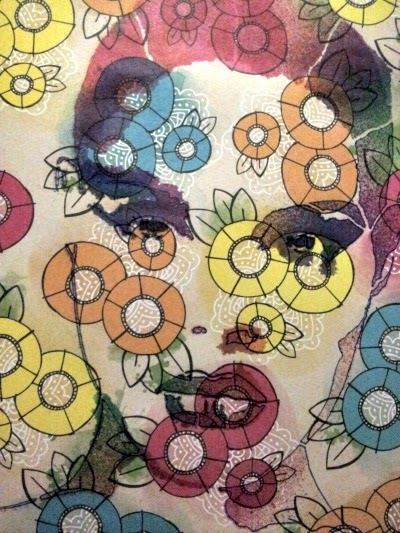 And how you just stenciled over a preciously stenciled page…turned out amazing. I need Eve, and probably Doris too. Thanks again! Paula, you really came up with some cool variations using this stencil! Not sure which one I like the most- so I'm just going to say all! I am AMAzed on the different styles you can make with this stencil. 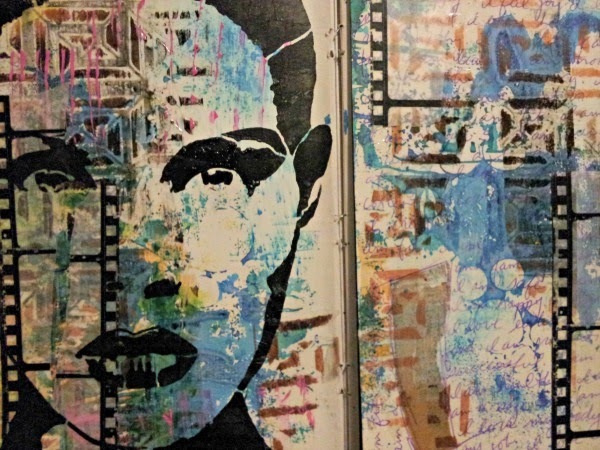 Love the different ways you showed what can be done with Andrea's stencil. I love the hot mess one too, really I do! My gosh there are some great ideas here! I've never thought to press a stencil between my journal pages.....I'll sure be trying that tonight! Love your modern, edgy pages....just delicious! What great techniques! 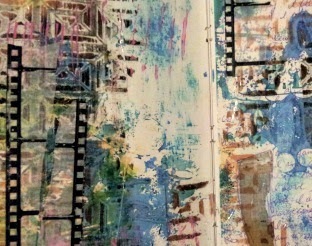 You have provided lots of ideas for play in my journal ..... thanks, and wish me luck to win a stencil to begin the play. Thank you for showing lots of ideas on how to use this stencil. Love the colors! Cool pages! It's fun to see your results from playing! Looks so fun. You must have had a ball with this. Love how you used this stencil!! 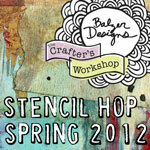 So many fabulous ideas for ways to create with this stencil! Love them. Absolutely in love with what you did with the spray inks and this stencil! Awesome looks! 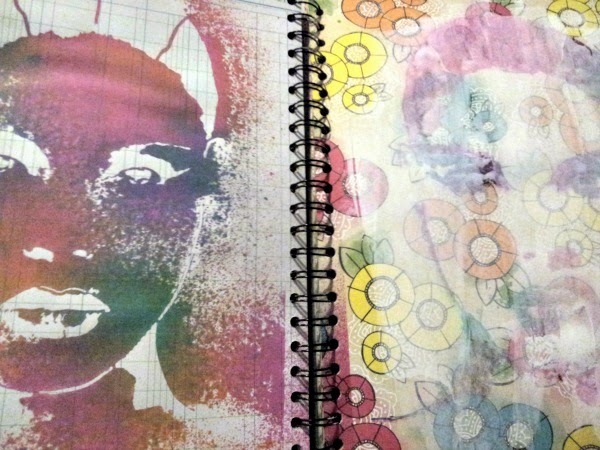 In the first step when you closed the journal to let it dry, did you leave the stencil between the pages? 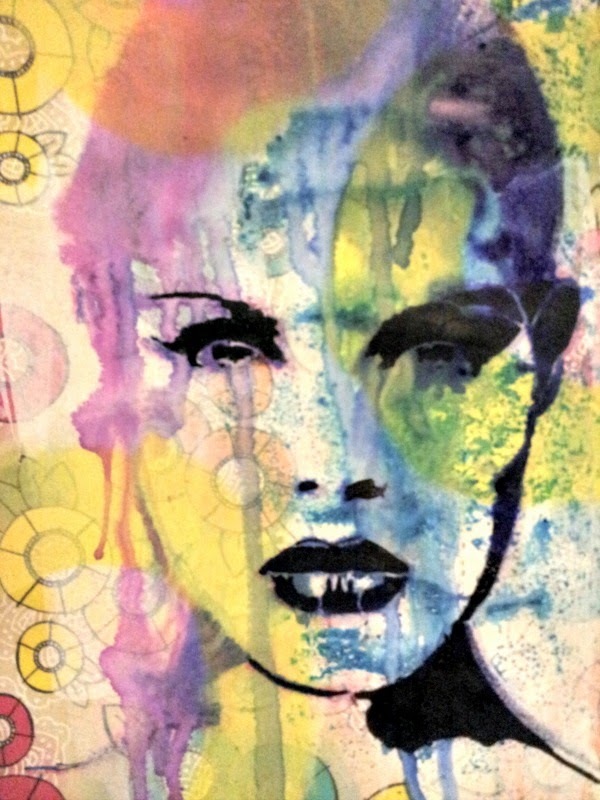 Paula, love the jpurnal pages," Eve, a modern woman "is a beautiful stencil, one I must own, I'm a face fanatic ,lol. also love the look of the spray mists, one of my favorite products to use. That was a real have at it use of the stencil, no fooling around. wow I really love the pages esp the packing transfer one! I've never commented before but dropped by because of the bloghop and and realized I'm already subscribed to your youtube channel. Eve is my favorite stencil out of the bunch and I love her even more after seeing all the creative ways you have used her. Thanks for the inspiration! Great to see you having fun exploring techniques with the stencil, very inspirational. Love the multiple applications of the stencil....lovely work of art! Wow Paula - you have sold me ... now i have to have that stencil!! What an interesting idea! I was amazed how things progressed. Really love what you did and will try it myself. Thanks for sharing.